Ethelfleda was descended from King Egbert the first great Wessex king, who was given the title Bretwalda or king of the British, and his son King Ethelwulf. Alfred was Ethelwulf's fourth son and never expected to be king. When Alfred was a boy, his father took him on a pilgrimage and they stayed several months in Rome where they met the Pope This seems to have awakened Alfred's interest in both religion and learning. 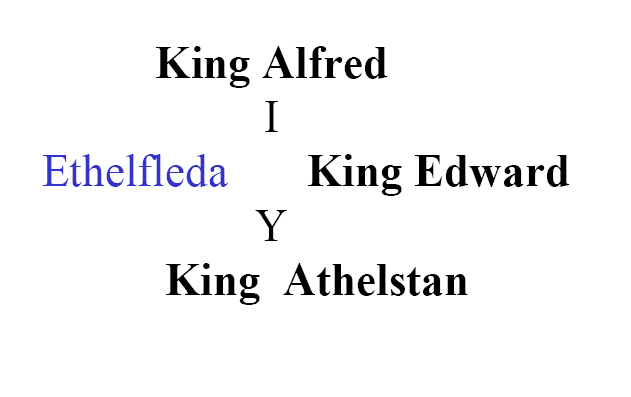 The other key people are Ethelfleda's husband Etheldred and the kings who followed Alfred, her brother Edward and her foster son Athelstan, who you will meet again later. Ethelfleda was the daughter of King Alfred the Great. Why was Alfred given this title of "the Great"? During Alfred's reign the foundations of English language, law and culture were established and were sustained by his successors after his death. It was important who governed England at that time. Alfred reassessed his strategy, built a fortified base at Athelney in the Somerset marshes and pursued guerrilla warfare against the Danes.